Revit Add-Ons: What are Your Favorite Revit Blogs? I fell quite far behind on blog posts for Revit Add-ons this Spring and early Summer, and have spent the past couple of months trying to catch up, as the following image attests. I spent the last week or so combing through Luke Johnson's What Revit Wants blog for add-in information to share here. It was hard - that Luke Johnson guy is one busy bee. 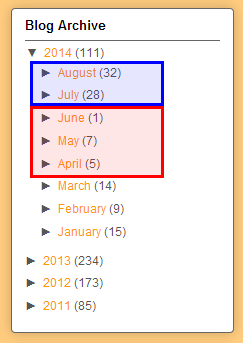 But it got me thinking about what blogs I find most useful for source information to populate Revit Add-ons with. Over on his Revit Op-Ed blog, Steve Stafford has a comprehensive list of Revit-focused blogs. This is a great resource, even if Steve doesn't follow Revit Add-ons. D'ohh! 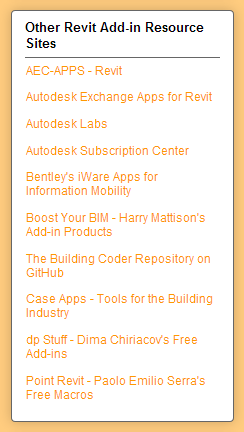 On Revit Add-ons, I have a widget with links to other Revit add-in resource sites. Several of these sites are blogs. 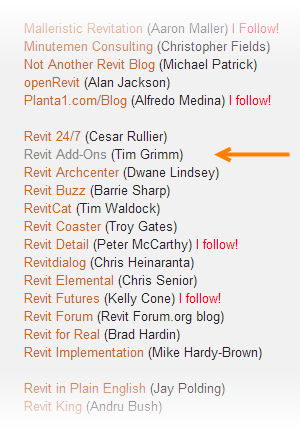 At the top of my list of most useful blogs is What Revit Wants. On this blog, Luke Johnson posts about a lot of Revit add-ins, but he doesn't limit himself to information only of this type. He posts about lots of BIM-related applications like Navisworks, Sketchup, etc, and the occasional add-in for these too. He also posts how to's, quick start guides, and more. Damn good. I like Scott Sheppard's It's Alive in the Lab blog, from the knowing reference to the original Frankenstein movie to the well-written and informative posts about the different technology previews moving through Autodesk Labs. Jeremy Tammik's The Building Coder blog is an exceptional resource for do-it-yourselfers. This level of transparency from a major vendor's employee is unprecedented in my experience, and his site is essential for any Revit API developer, be they neophyte or expert. Along the same lines as Jeremy's blog are also Harry Mattison's Boost Your BIM blog and Paolo Emilio Serra's Punto Revit blog. So, those are my top 5 blog resources. If you'd like to share your favorite Revit-related blogs, please leave a comment to this post. Good to know Steve, and thanks.